A rich and delicious paneer curry that features fried paneer tossed in a coconut-pumpkin curry sauce. To get started, prep the paneer and garlic. Slice the paneer into roughly ¼” thick slices then peel and mince the garlic. That’s it- that’s about the amount of prep for this meal! Heat a large skillet over medium-low heat. Add oil, enough to coat the bottom of the pan. Add the slices of paneer and fry until crisp and golden, flipping once during cooking. Remove from the pan, reduce the heat to low, and add the minced garlic to the pan. Cook for a minute or so, until the garlic is golden then add in the pumpkin puree, curry powder, and coconut milk. Let simmer for 6 to 8 minutes, enough time to let the flavors mingle and warm. If the sauce becomes too thick, add a bit of vegetable broth as needed. Once the sauce is done, taste and add salt if needed. This will depend on the salt level of the curry powder. Turn off the heat and add the fried paneer into the sauce, stirring/flipping to coat the paneer in the sauce. Divide the grains into two bowls and top with the slices of paneer and curry sauce. Serve with cilantro and a wedge of lemon. 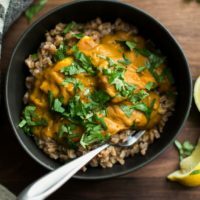 Tips + Tricks: I served this dish over barley (I like the texture/flavor) but it would work just as well with brown rice or quinoa. *Nutrition count does not count grains.